HOME Garden Share- What's it all about? This year we're launching a new program! When I gave a critical look at my offerings as a small biz, it became clear that if you weren't looking to start a garden and you weren't a restaurant, there wasn't a whole lot here for you! So we're changing that as we head into our second season. HOME Garden Share came from me really wanting to grow more flowers and sell them direct to consumers. I've always been a veggie grower and flowers have been secondary BUT NOT ANYMORE. I am psyched to grow more flowers this year! In addition to growing them, I happen to own an impressive collection of vases so I thought why not provide a service that gives you the flowers AND the vessel. So, that's the main part of HOME Garden Share. Beautiful blooms in cool vases in your house every other week from May-October. That's 12 bouquets! 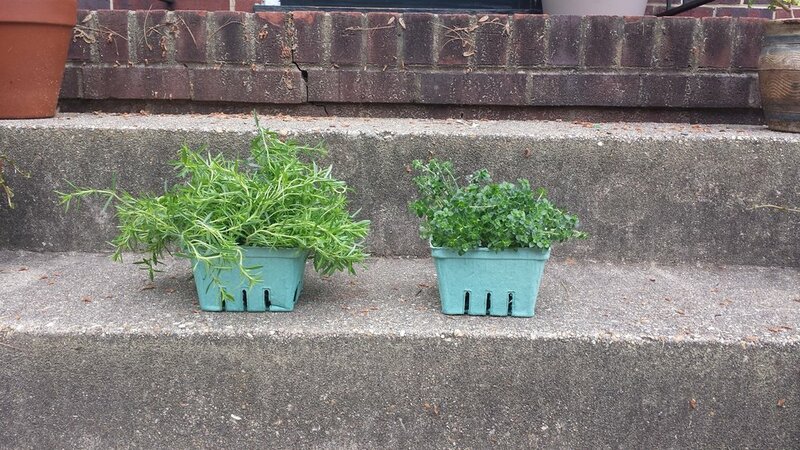 But, I grow a lot of herbs. I can't leave those tasty items out entirely! Each share will get two culinary herbs along with recipe ideas and inspiration so you can try some new things in the kitchen this season. Items like Lemon Basil, Vietnamese Coriander, Wild Thyme, and lots of others will give your dishes added flavor and interest. This is delicious stuff! Lastly, being a small business has made me more invested than ever before in supporting other small businesses. To make this a really unique service, I'm partnering with other local folks to give you a collaboration item in your share. Every once in a while you'll have an herb salt or something similar from me as your value added but more times than not you'll be enjoying goodies from Nightingale Ice Cream Sandwiches (Lavender/Earl Grey FTW! ), Maven Made, my non-profit buds Community Food Collaborative, Bon Air Naturals, and Roots Tea Infusions! I have a couple spots left for possible collaborations so stay tuned for more :). So, logistically, how does this all work? Easy! There are two pick up spots: Little House Green Grocery in Northside and Perk Bon Air in Southside. You choose one and every other week on Thursdays (don't worry, you'll get a printed schedule! ), I will drop off your goodies. You just pick them up! All it takes to sign up is $50 (and you get a Welcome Box!). After that you'll have two more payments of $150 and then $100, totaling $300 for the whole service. I can't shell out $300 for things all at once and I don't expect that of y'all either! You'll get an e-newsletter every other Monday (the week you get a share) telling you what you can expect! You can sign up here at the shop. I'll take care of the rest! Currently, I have 3 spots left at Perk and 5 left at Little House. I don't expect these to last so if you would like to participate head on over to the shop and let's get you set up! So, 1 super hyper very local bouquet, 2 yummy herbs for your kitchen, and a local collaboration item from HBG and another awesome RVA business. If you have any questions, shoot me an email at amanda (at) hbgrva.com!